Perhaps it will be that you are taking your lunch to work today. Or if you’ve already had lunch, then maybe you will plan to take your lunch to work with you later in the week. Maybe you had a big weekend and spent a little too much money, and now it’s time to hunker down and cook dinners at home all week. Maybe things are very tight and you’re wondering how you’re going to make it to the next payday. I want you to know that I UNDERSTAND HOW YOU’RE FEELING! I have been there, and if I’m going to be honest, sometimes I’m still there. No, I am not a financial advisor, I do not have ANY diplomas that give me any great knowledge into finances. I am simply someone who has been in all of those tight spots that I mentioned and would like to share with you what I’ve learned along the way. I am not a millionaire and I don’t have any books published about money. I am NOT an expert. I’m someone who has read those books. I am someone who went from worse than being broke to doing ok. And, if what I went through and learned from can help anyone else, then I’m cool with that. We’ll take this subject and break it down into steps. We’ll take one step every Monday. Cool? The first step on the first Money Monday is “Take a minute and think about Money today” I truly believe that this is the first step in changing things. Or, maybe things are GREAT right now, and you don’t have to worry about money. AWESOME! But, give it some thought. How much money do you have in your checking account right now. Have you added up all the check card swipes from the weekend? Have you balanced your checkbook today, this weekend, this week, this month??? Let’s start there. Take a minute today and show yourself just how much money you have right now. That’s it, that’s the only step we are going to take today. But don’t just say… hhhmmm, oh I have about $$$ right now. I want you to actually run the numbers and get it to the penny of how much you have. That’s the entire point. To know exactly. You need to know exactly. I know, Mondays are hard enough, right? But, we got to start somewhere. Oh, one other thing OK? Now make a list of the things you’re going to cook for dinner this week and lunches your going to pack, and skip the grocery store and the take out, because I’ll bet you already have stuff at home. Give it some real thought…. Sure, it might not be typical dinners and lunches, but it’s food. Food that will save you money, and that always taste good. The pic at the top of the page is my binder of recipes. 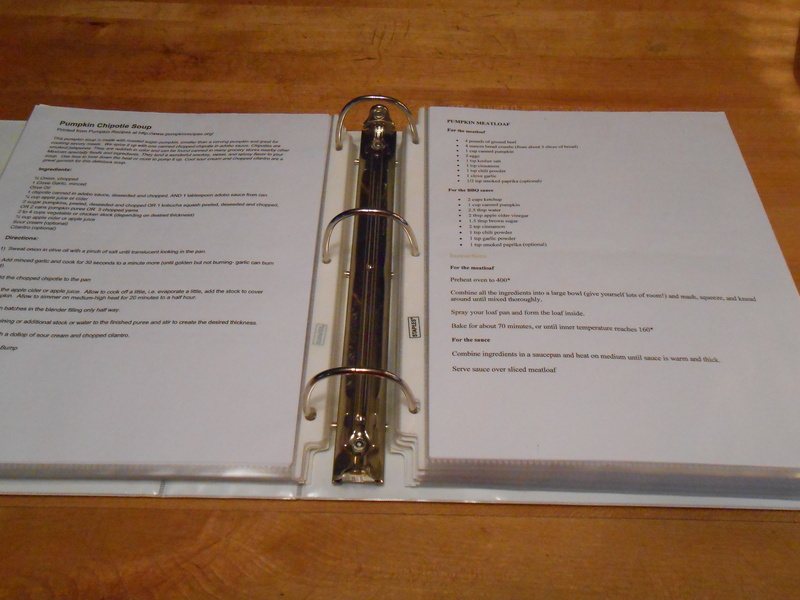 If I make or find a recipe I like, I print it, put it into a sheet protector (important for me as I tend to make a mess) and into the binder it goes. 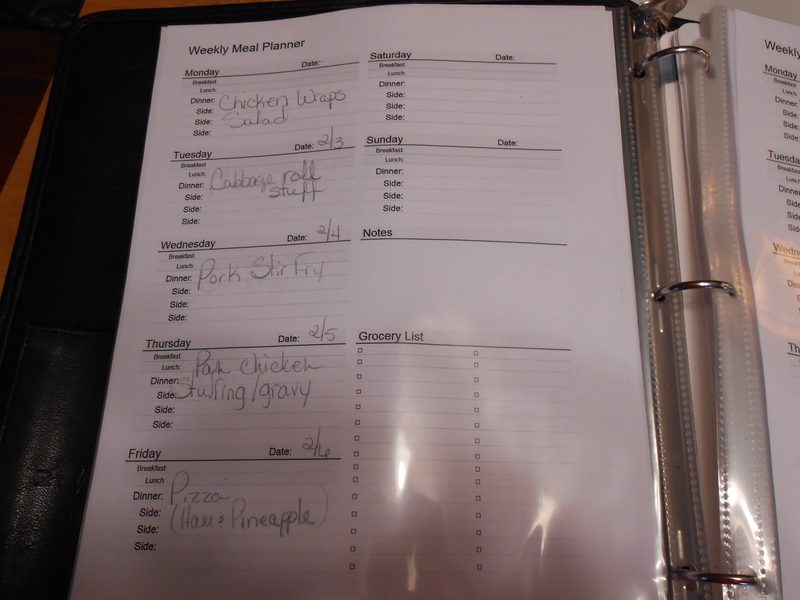 The two pics just above are of my meal planner binder. 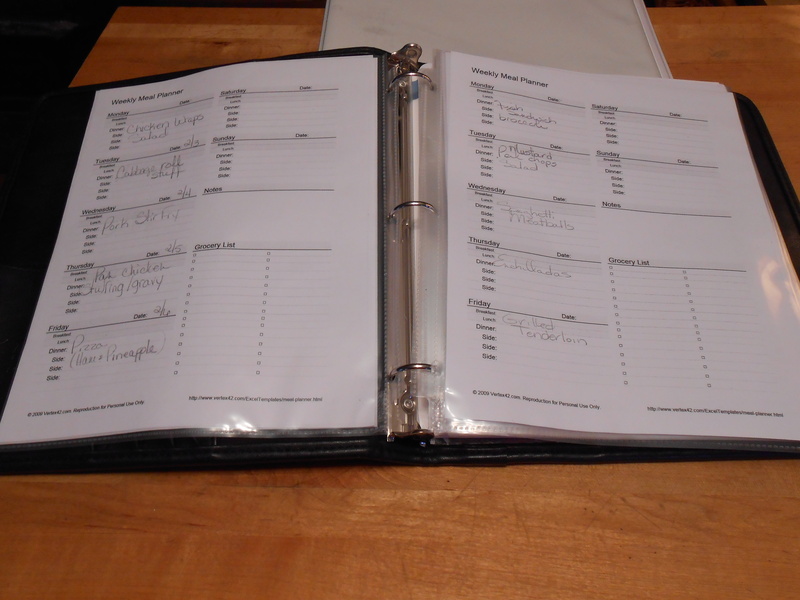 I keep them in a binder so I can refer to it when I’m stuck for ideas on what to cook. These two things make my life much easier when it comes to dinner time. The weekly meal planner is just a simple form I found on-line. If you need some ideas or want to share what crazy meals you came up with and liked or didn’t like, we would love to hear about it. Posted on March 3, 2014 by LoriPosted in Monday MoneyTagged Money.